Phil Williammee has created an application that can communicate with the the PhantomX Pincher through PyPose. pyPincher will allow you to control the Pincher via rotation, extension, and height, along with gripper angle and the gripper itself. 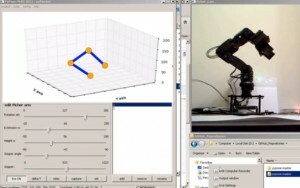 The program will then also give you a 3D representation of the arm’s current position. You can even load different coordinates and toggle between them! This is just another great example of how users can leverage the open software and firmware of the InterbotiX robots to create custom setups. This entry was posted on Thursday, July 18th, 2013 at 10:40 am	and is filed under Featured Projects / Robots, Front Page News. You can follow any responses to this entry through the RSS 2.0 feed. You can leave a response, or trackback from your own site.